The SE34-I is two separate EL34 based Zen mono amplifiers and a single tube version of the ZTPRE preamplifier. Basically an incarnation of the Signature system combined into one chassis! Fast, very holographic, detailed and very airy. Not stuck with one sound. Very little hum or noise floor hiss. Well built. Great binding posts and jacks. Standby switches are handy to have when swapping stuff. Brown case is rather boring looking, but very durable. Runs very hot. Preamp output not standard. Owners manual is not as visually explicit in regards to all the hookup options, but you'll figure it out eventually. This will now be my 3rd foray into the world of tube amps. The SE34i caught my eye for one main reason; adjustability. You get three switches (well, two actually) and a few different hookup	ube configurations that allow for different sounds. At least that is what they say. The difference between marketing blather and what my ears hear has been consistently huge. With this amp most of what Steve wrote about on the site is true. The switches really do offer a truly noticeable difference and not just to nerds who hear differences in the plating on binding posts. I would describe the effects as more akin to the ones you might hear on a guitar amp. The center switch gives a bass boost and alters the character of the midrange. Throw the sucker back and forth during some heavy guitar music and you can really choose what you prefer. I didn't notice as big of a change with single or dual tube configs, but it's still there. The amps seems to have good midrange detail and soundstaging, but to be honest I was never able to get a 3D image with my current speakers oom. It is rather expensive, but it does things no other amp does. I really think the preamp output should be a standard feature, though. Decware is a pretty cool company. I like the idea of enthusiastic guys tinkering in their basement and coming up with stuff that working class listeners can actually afford. Well, sorta. Sound quality, adjustability, cheap to retube, beautiful quality construction. No balance control and only one volume control, not enough power to drive typical inefficient speakers. This is a great integrated amplifier! It has enough power, 7 wpc, to drive most 90dB and above speakers with ease but has a clean and precise sound similar to Decware's other Zen amps. Its single-ended triode sound is wonderful! It has 4 inputs with a single volume control. But it is more than that. It is uniquely flexible in its configuration. 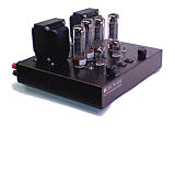 It is a parallel SET amp that uses two EL34s per channel. But the really unsusual thing about its design is that it has four output transformers, one for each tube. It can easily be set up to run one tube per channel for only 3.5 wpc. One tube on each side is wired for 'true-triode' mode, the other for 'pseudo-triode' mode. They each sound different. The 'true' sounds a lot like a 2A3, and the 'pseudo' sounds more like a Decware Zen. In addition to the four different wiring schemes (2-tubes, true and pseudo triode; and 4-tube, series and parallel), there are two switches that alter the voltage between the preamp and input stages, which changes the sound, and one switch that alters the bias. Given all these adjustments, if the SE34-I doesn't sound the way you want it to, it can be changed until it does. And, unlike the Zen Triode SE84 amps, you don't have to have super-efficient speakers for the SE34. 90dB works very well, as long as you don't listen at live concert levels. Fisher 400C, Moth Audio 2A3, Decware Zen Triode, ASL Tulip.